Not a big camper but we had some fun on trips with our RV (we’re not really RVers, either). Best trip while we still lived in Texas was to Marfa and the Big Bend area over Christmas one year. We had NO idea how cold it was going to be and we were freezing in that RV! Had to pop over to the local hardware store the next morning to buy some portable heaters. But the cold made for some clear nights which was good when we were trying to spot the Marfa lights (and no, we never saw them). Sounds like a memory you won’t forget anytime soon. How nice that you shared that experience with a loved one. My writing goals for this year are already being overtaken by another goal, and that is to take care of the body parts I neglected until after our daughter’s wedding. Between finger and foot problems, I may end up with more downtime than I’d counted on, but it’s necessary. I’ll have to make adjustments along the way as required. That’s the advantage of being an indie author. Deadlines are self-imposed and can be altered. NOT a camper, but I did try. The last attempt was actually on the lawn of the farm where my mother grew up. My sisters and their families were all camping and lent us a tent. With the farmhouse close by, we had food and facilities (even though my sisters used their camp stoves). It rained. It was cold. There were tics. That was a never again experience. For my goals, I do set them out, and implement an action plan for the year. I make sure they are SMART goals, specific, measurable, achievable, realistic. I went easy on myself this year. It’s more about the process than the achievability. It tickles me that people are either all-in or a NO to camping. There’s not room for gray area in the middle. Folks either like it or they don’t. Turns out I wasn’t a big fan of camping either because we basically had to pack up everything to take with us, use it, and then put it all away when we got home. Seemed easier to me to stay home and take day trips places, LOL. My take home from your experience, Karla, is that you participated in camping to make memories with your family, which is a noble goal. I’m sure there are some keeper memories in there besides the negative impact of camping. 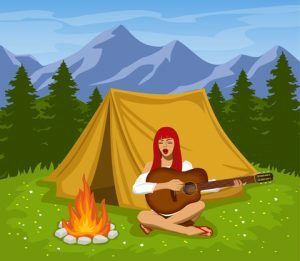 Best, it allowed your family to see that camping wasn’t for you, so hopefully they chose another style of get together for your next family excursion. I love creating goals, breaking them down to tasks, and then setting monthly, weekly, and daily targets. You nailed the problem — implementation. I’ve learned to lower the targets and let in more room for life. As a child, camping was the only way we could vacation. One one trip to the Lake Cumberland State Park in Kentucky, we started our vacation early on Friday so that we could choose the best campsite with a view of the lake. We were the first campers there and chose the absolute perfect view. That night it rained like fury and the slight downhill grade formed a running stream that ran right through our tent site. What a mess. Next morning we packed up and moved to one of the sites along the entry road, not anyone’s first pick! It turned out to be level, dry, quiet, and best of all, we had our own private beach on the lake. Best camping vacation ever! Breaking goals into small, measurable steps is critical if you want to succeed. As for camping … my parents were NOT campers. NOT. My only experiences with camping came from Girl Scouts, and were held in organized Scout camps. Maybe it’s because it was so long ago, and everyone just went with the flow, but from our end, everything was great. I think most campers are high energy people. They get jazzed by doing more and more stuff outside. The rest of us get bogged down in the logistics of the experience, the possible inconveniences, and the break in our routines. Kudos to you, Terry, for trying camping and for going with the flow. That says so much about your willingness to try new experiences and thrive!